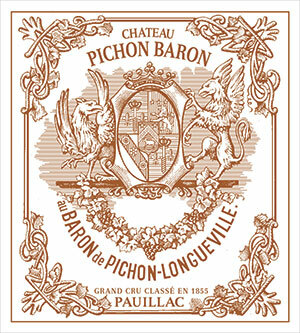 An undeniable star of the vintage, Pichon-Baron’s 2004 boasts an inky/ruby/purple color to the rim as well as a big, sweet nose of melted licorice, chocolate, black currant jam, truffles, and charcoal embers. Soft tannin, full body, and abundant opulence and flesh are atypical for the vintage character, but this wine is loaded. Pure, ripe, and evolved, it should be at its finest between 2009-2022. Tasted at the London Pichon-Baron off-line. This is a great, great 2004 – a huge success for Christian Seely in a more challenging growing season than the ensuing one. A soaring blackberry, blueberry, cedar and wild strawberry nose with a touch of violets. Very fine tannins on the full-bodied palate, superb focus, elegant and feminine with a touch of burst toast and graphite on the finish. Great persistency. Quintessential Pauillac – at its finest. Drink 2012-2025. Tasted May 2009.